Google has a habit of killing apps and services, and the latest victim of its killing spree is the much loved “Inbox by Gmail” app that brought along a bunch of really useful and amazing features, making inbox management a breeze for users. If you were one of the many ‘Inbox’ users, chances are you’ve switched to Gmail, at least for the time being, and chances are you’re not very happy with it. Gmail did receive a bunch of Inbox’s features, but it’s not quite there, it doesn’t have the pinning features, it doesn’t have the email scheduling, and the way emails are arranged in Gmail can be a huge shock to people used to Inbox. However, all hope is not lost, because one of the best Inbox alternatives has finally made its way to Android, at the perfect day in fact. There may be many reasons why you preferred using Inbox over Gmail, and one of the major ones was probably the user interface. While Gmail’s UI has gotten better, it’s nowhere near what Inbox offered. Spark Mail, on the other hand, has a pretty great UI, that offers all your most important emails at a glance. For starters, the latest notifications appear on top, which is great, because those are probably what you care about the most anyway. You can quickly get through your notifications by either swiping them away (which is just very satisfactory) or just tapping on the ‘tick mark’ up top to mark all of your notifications as “done.” Yes, Inbox Zero is as easy as that with Spark. Other than that, Spark Mail’s entire UI is just very well organized, and a lot better than Gmail’s. If you’re moving away from Inbox, skip Gmail and check out Spark Mail first. However, long time Gmail users might find the new interface a tad daunting because there’s just so many options and features here. Do you love swiping away your emails? Spark Mail brings all the swipe gestures you might ever need. You can make a short-swipe to the left to pin or unpin an email, a long swipe to the left to delete an email, a short swipe to the right to mark emails as read/unread, and a long swipe to the right to archive emails. 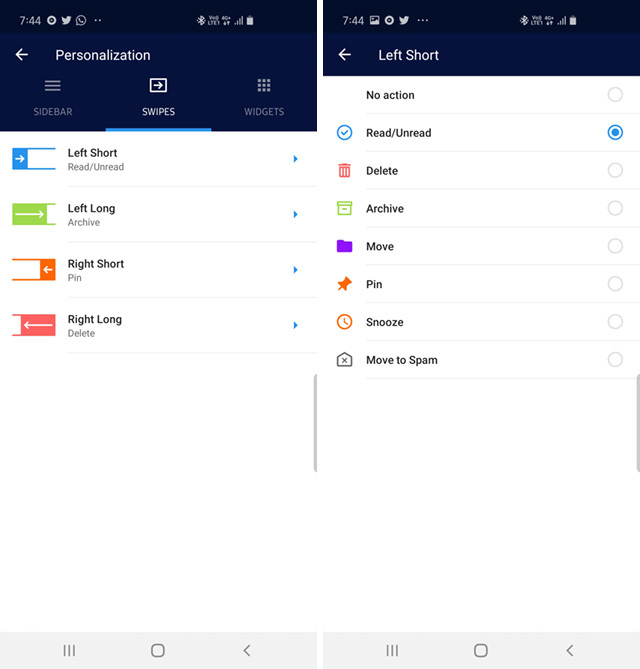 What’s more, these swipes are customisable, so you can choose to change the actions attached to each type of swipe, from options like snooze, move, snooze, and move to folder, along side all the other actions that they’re already tied to. You can also remove actions from a swipe by choosing the ‘No action‘ option when you’re customising it. Spark Mail also divides the sidebar into a top section, and a bottom section. 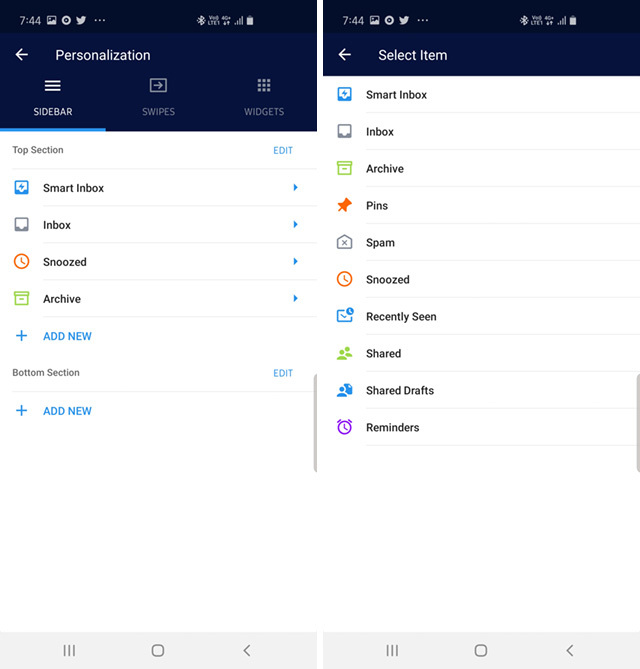 While both these sections offer the same options, it’s pretty cool because you can easily arrange these options into the top section and bottom section to keep more commonly used options on the top section, and others on the bottom if you want, or you can leave the bottom section empty, like it is by default. You also get support for widgets with Spark Mail, and these are not your usual home screen widgets (Spark currently doesn’t offer those). Instead, these widgets let you customise the top-bar of Spark to add up to two buttons to things you want easy access to, or add up to 4 buttons on the bottom. You can choose from things like ‘Pins,’ ‘Archive,’ ‘Trash,’ ‘Drafts,’ and a lot more. Personally, I’m using Pins and Snoozed because I use those features very often, and having easy access to these is great for me. Spark also brings scheduling capabilities to your email arsenal. So you can write your emails whenever you want to, and instead of having to save them in drafts, you can just schedule them to be sent later. Spark then automatically sends these emails out to the recipients. You can customise the times for this ‘Send Later’ feature to your liking, which is just perfect. If you were using Inbox’s snooze feature a lot, and I won’t blame you if you were, you’ll be glad to know Spark Mail brings that feature in tow as well. You can easily snooze emails with just a swipe, and choose a time to be reminded about the email. This is great for handling emails that come in when you’re not ready to read and/or reply to them, but are important enough that you want to. You can even customise the default snooze time options that Spark Mail gives you, to better suit your preferences. Spark Mail tries to be amazing at handling notifications. No matter what you do, or how careful you’ve been with your email addresses, chances are you get a ton of spam. 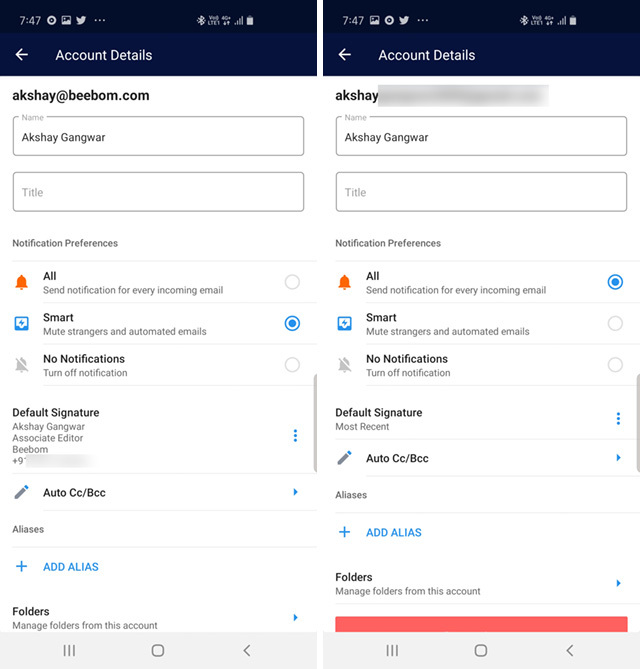 With Spark, you can set notifications to “Smart” to block notifications for emails from strangers, and all the automated emails like newsletters. You can also choose to simply enable ‘No notifications’ to block all notifications. Obviously, there’s the “All” notifications option that doesn’t filter anything out. The best part about this is that you can set these preferences on a per-account basis, so you can ensure you get all your work emails, but aren’t annoyed by constant auto-emails on your personal email address, while still getting personal emails from people you care about. If you get a ton of confidential email, you can use Spark’s ‘Passkey Lock’ feature to lock your email client. You can then set a custom passkey, and enable biometric authentication as well, to unlock Spark Mail with your fingerprint. It’s pretty cool, and is definitely useful for people who get a lot of private emails. 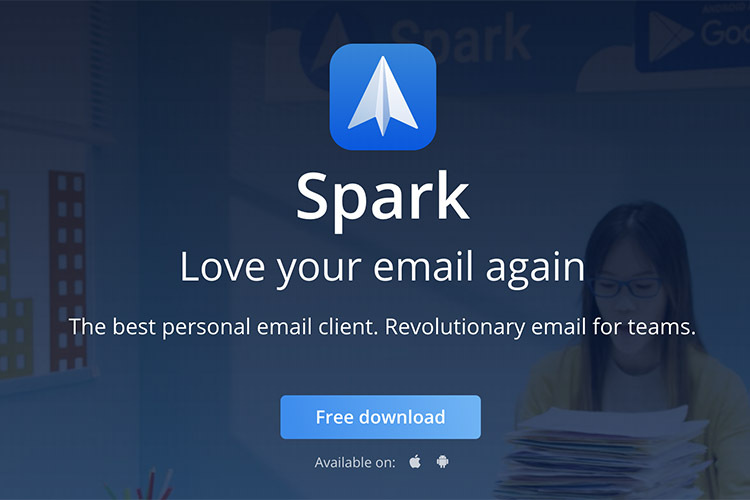 One of the best things about Spark Mail is that it allows you to use all these Inbox by Gmail-like features on email addresses from any email provider, be it Yahoo!, iCloud, Outlook, Exchange, or anything else. So, you no longer need to keep your old Yahoo address in a separate place, you can use all of Spark Mail’s features to manage your email from every provider out there. If you’re wondering about the price of this ridiculously awesome email client, here’s a great surprise: Spark Mail is free, and it brings all of its features in the free version. However, you can upgrade to a paid plan for more leeway on using some of its features. For examples, if you’re using Spark Mail’s email delegation, or shared drafts features, the free version only lets you have up to 2 active collaborators, and up to 10 delegates per team.